Pyxis© is a web-based risk analysis tool for capital projects and turnarounds in the petroleum, energy, and chemical industries. 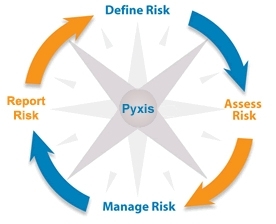 Derived from the Greek word for compass, Pyxis© helps teams easily navigate the risk management process. It provides a means of identifying risks, assessing their impact, and tracking risk response actions on a real time basis. It can be used at all stages in the life cycle of a project or plant turnaround. The tool's Default Entries feature allow teams to begin the risk management process within minutes of logging-onto the system and access a proprietary database of the industry's most common threats and opportunities. The tool contains a comprehensive suite of reporting options as well as e-mail notification reminders to risk-owners. Pyxis© has been designed to be easily accessible by all team members and requires minimal upfront training by users. Copyright© 2005-2019 Asset Performance Networks, LLC. | All Rights Reserved. Are you a new Pyxis© subscriber? For more information about our product and services.